마야쥐(Peromyscus mayensis)는 비단털쥐과에 속하는 설치류의 일종이다. 과테말라에서만 발견된다. ↑ Reid, F., Pérez, S., Woodman, N. & Matson, J. (2008). 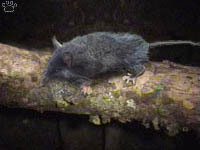 Peromyscus mayensis. 2008 IUCN Red List of Threatened Species. Downloaded on 28 February 2009. 이 문서는 2018년 8월 29일 (수) 06:31에 마지막으로 편집되었습니다.